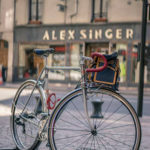 “Alex Singer” sounds like a name you might more associate with the fumbling lead character in a classic Woody Allen movie than with what many consider the most revered bicycle builder and outfitter ever. 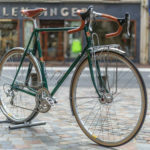 Yet this tiny shop, first opened by its namesake founder some 80 years ago in Paris, France — which still occupies the same storefront on rue Victor-Hugo in Levallois-Perret — has been producing touring bicycles and tandems of exquisite form and workmanlike function for so long it can fairly be said to have defined the handmade bicycle paradigm. 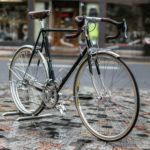 Indeed, companies like Rivendell and Kogswell are now applying Singer-like production methods to bikes available at less breathtaking prices than the originals. 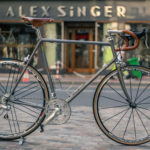 But nothing surpasses the real thing: for the builders at Cycles Alex Singer are what one calls “constructeurs” — they create the entire bicycle, often designing and building one-off custom racks and highly individualized lighting systems — to craft machines built not just to a purpose but to a person. 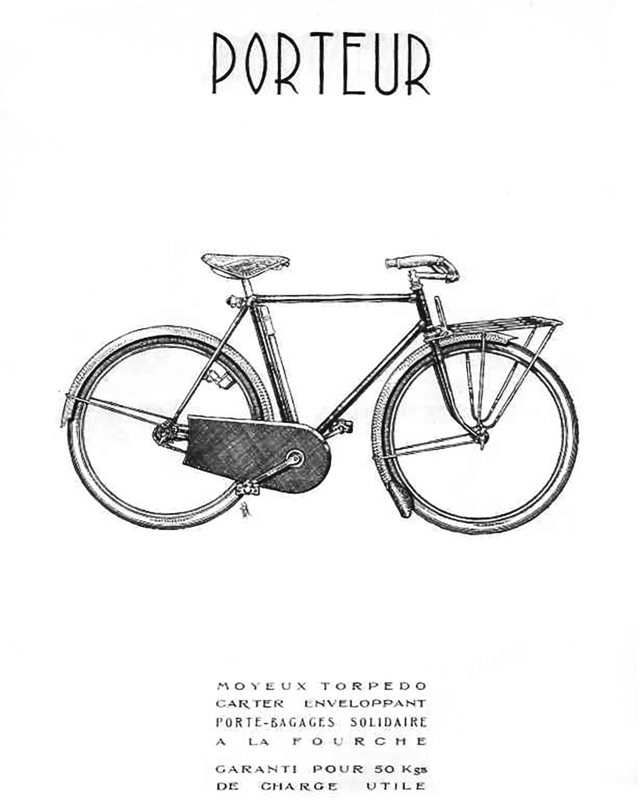 Alex Singer was born in 1905, at the tail end of the first bike boom, and soon became a club rider with “Clignancourt-Sportif,” a Parisian roadie group that later became uniquely involved with bicycle polo. After a few years playing the post-War-to-End-All-Wars equivalent of today’s spandex superheroes, he married and settled down, somewhat. Perhaps this was the first time Singer considered having children, and how important it is for them to learn early riding skills on comfortable and reliable bicycles. 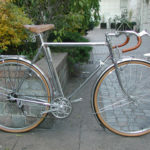 Singer became an enthusiastic bicycle tourist, riding most of the great French brevet and randonnée events at the time. He also toured with his wife on a tandem, once riding from Paris all the way to Budapest — a quick 1,000 mile outing when traveled on modern roads. 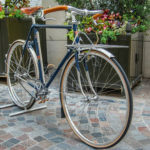 Roads in France after WWI were far from the finest, though, and this must have provided Singer with inspiration to develop a bicycle better suited to the fast multi-day rides he so enjoyed. 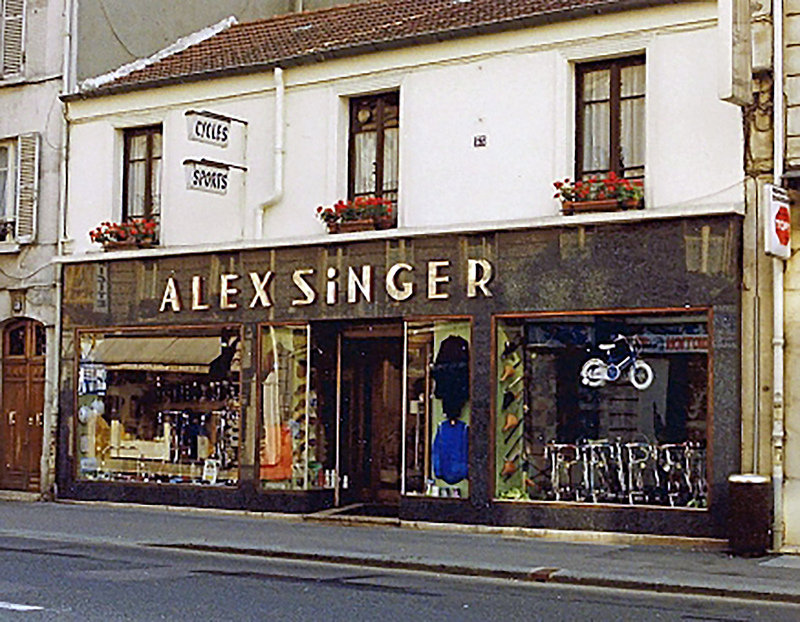 In 1938 Singer opened a bicycle atelier under his full name at the current 53, rue Victor-Hugo address. The first five bicycles he produced were all touring tandems. 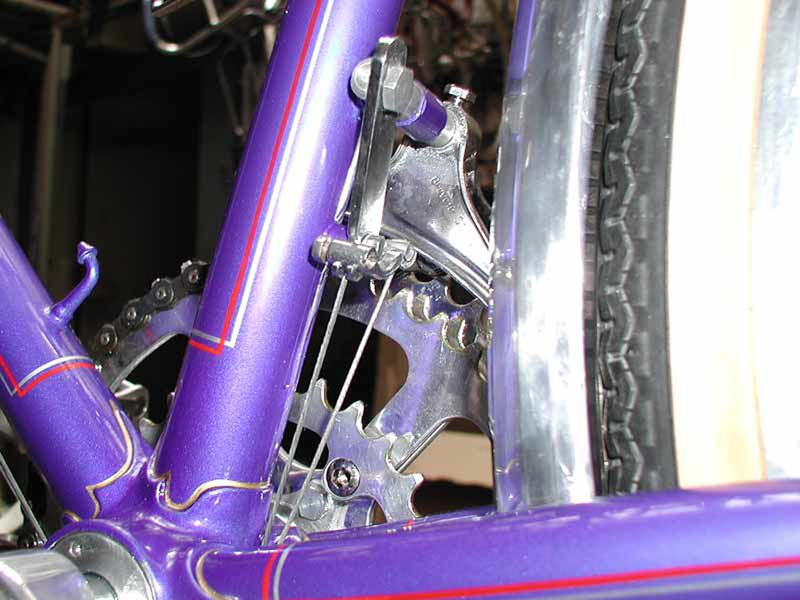 Alex Singer didn’t just build bicycles, he developed the craft of building and then outfitting bicycles that were carefully specified and highly individualized performance machines meant for specific riders or even one-time purposes. 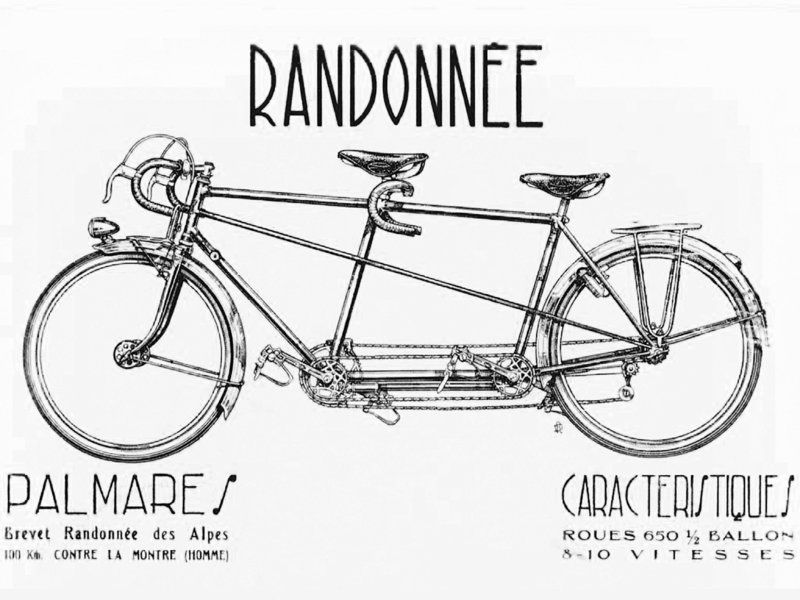 In 1939, just a year after opening his shop, Singer and his wife entered a competition on a tandem weighing 12.975 kg, or 28 lbs — with fenders, racks and even working lights! 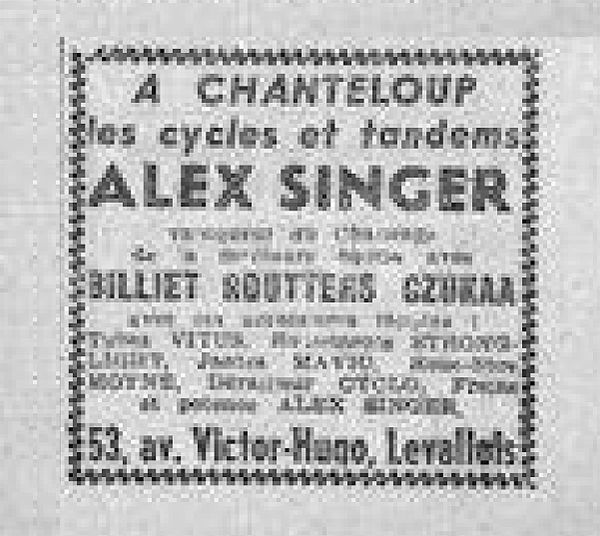 A small advertisement in the daily Parisian newspaper, Ce Soir (formerly Paris-Soir), dated October 2, 1945 shows Alex Singer was marketing both singles and tandems made by builders named “Billiet,” “Routters” and “Czukaa.” In 1946 his atelier produced a single bike weighing but 6.875 kg, or 15lbs, and also offered a production (non-custom) tandem weighing a feathery 15.94 kg, or just 35 lbs. 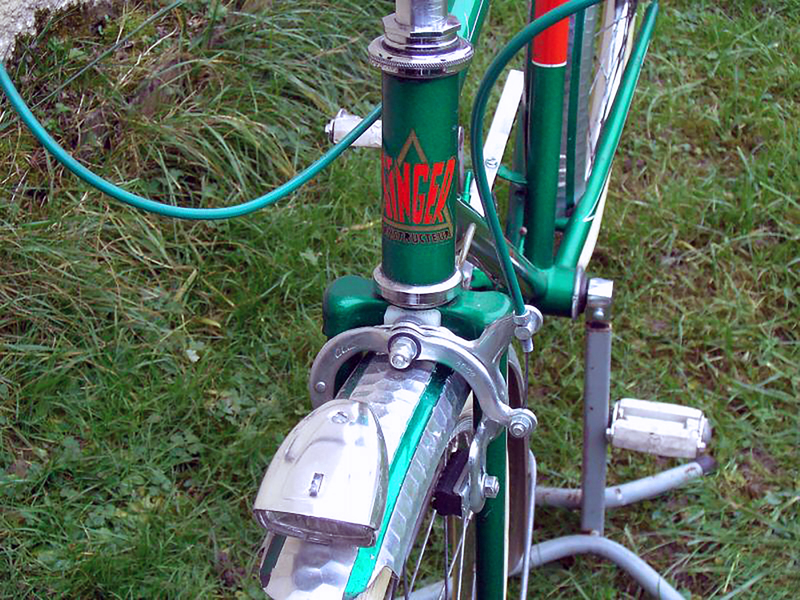 Remember, Singer bikes were made for long distance touring on bad roads in variable weather conditions, and so always included fenders, lights and racks. In 1964, two years before passing away, Singer accorded construction duties to longtime apprentice and nephew Ernest Csuka(a) and his brother Roland. By then Ernest had been working with Singer for twenty years and had ample opportunity for proving his skills to the old master. 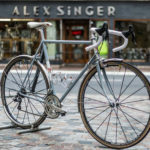 Roland passed away in 1994, and in 2002, Ernest entrusted the operation to his own son Olivier, who continues building bicycles that merit the reverence the world has bestowed upon Cycles Alex Singer creations since their inception seventy-plus years ago. 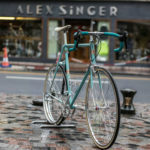 Standards at Cycles Alex Singer remain extremely high: Csuka firmly believes tube sets offered today fail to achieve the caliber required for the sort of tandem Singer had always built — so the company no longer offer tandems. 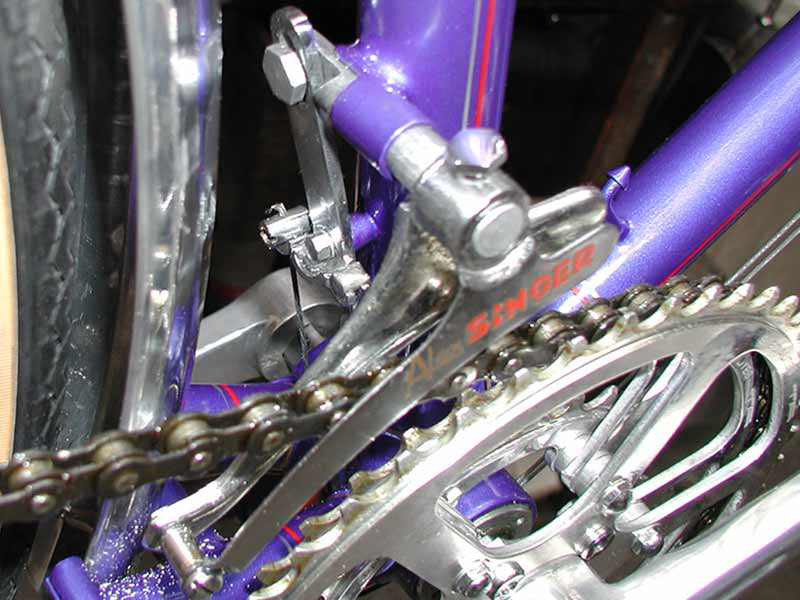 (They continue happily servicing their older tandems, of course, and even those of other classic French marques also built to an appreciably high standard). 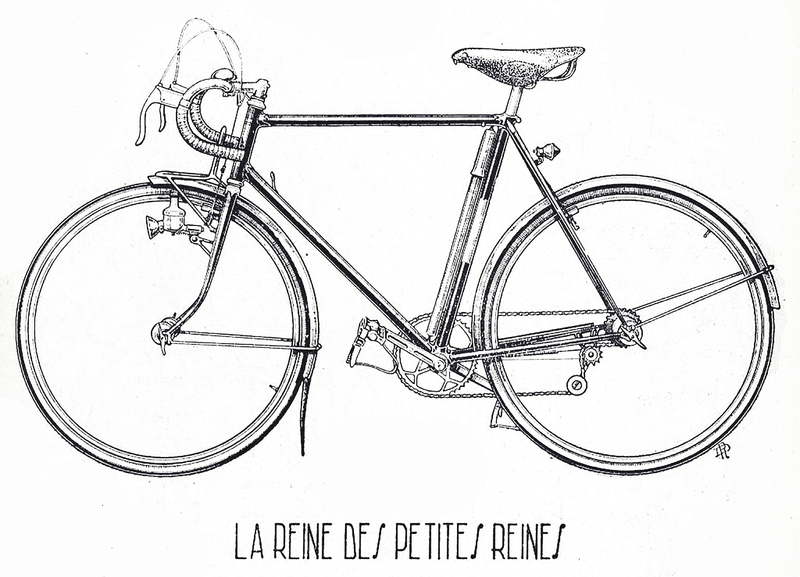 But single bikes, primarily randonneusses — continue to grow in the shop — though they are not easy to get. 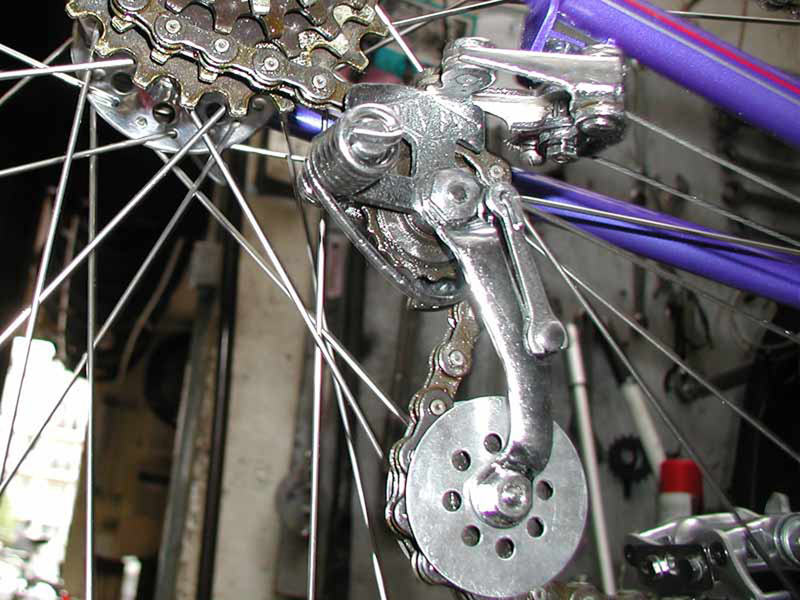 They make as few as fifty, and never as many as 100, bicycles per year, with production averaging (according to an article in Paris Evous) just 78 machines each year — with some authorities believing the actual number to be far lower. Prices are in the generous five figures. No customer ever complains. So, did Alex Singer possess the soul of a tinkerer, an engineer or an artist? 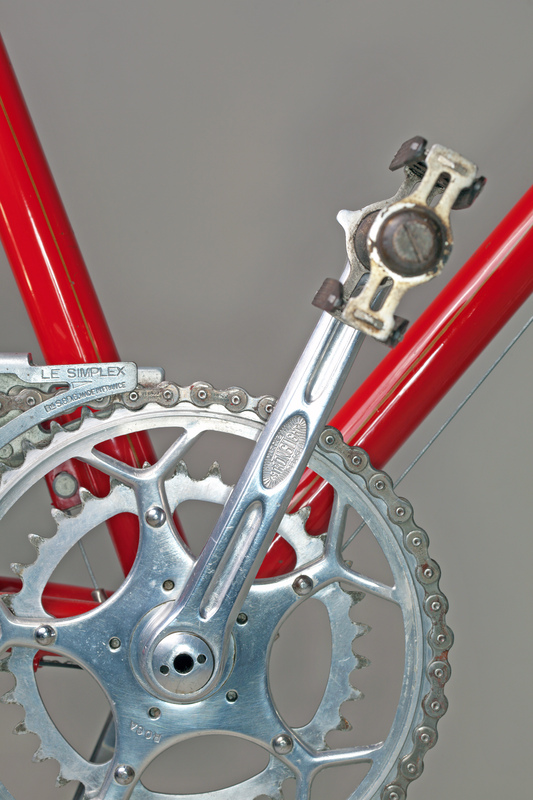 His legacy — the lineage of bikes he created and present-day shop they continue coming from — shout “oui” to all three. As noted by a French writer who visited the shop in early 2006, “Those who love plastic and carbon fiber, just move on. Welcome to the kingdom of leather, rubber and steel!” He also referred to Ernest Csuka as a “living treasure.” Each frame requires roughly sixty hours work, before painting and finish detailing even begin. Each frame is also made to measure for a particular client. 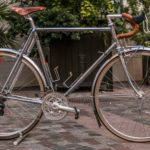 Singer, Ernest and now Olivier will wait months for exactly the right parts needed to build a particular bicycle, even if an ordinary product might be more readily available. Apparently the word “ordinary” has no place in the Cycles Alex Singer lexicon. 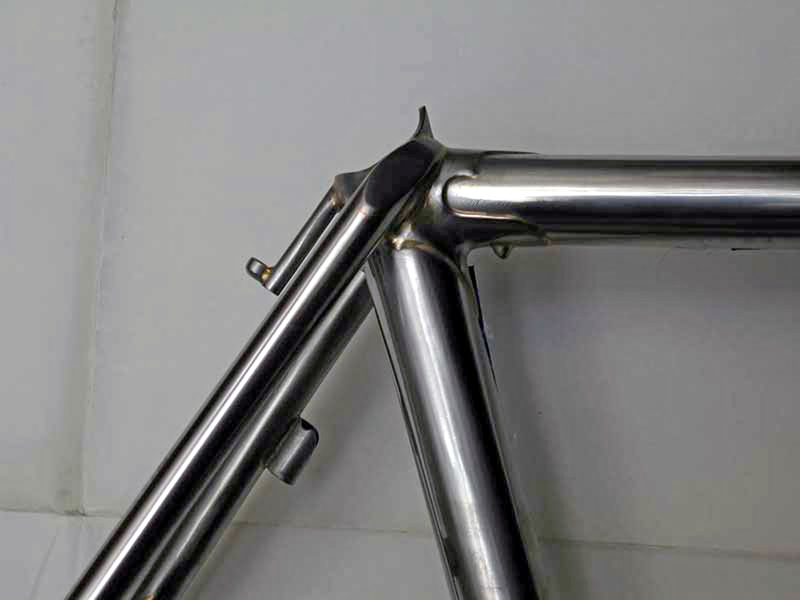 The Japanese, famously demanding of perfection while still remaining appreciative of it, not only favor the originals but support an entire subculture of framebuilders who make French-style — that is, Singer-style — bicycles for serious collectors (and even riders!) in that country. 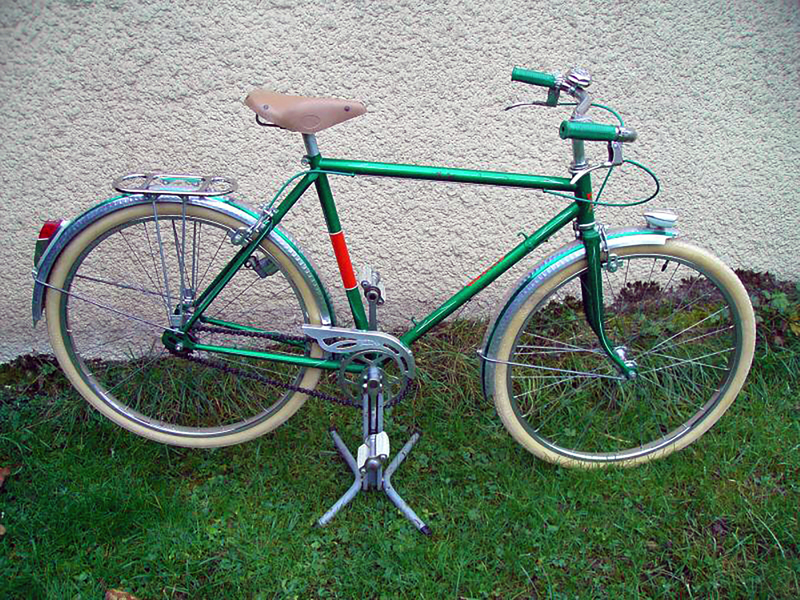 Bikes that look almost precisely like Singer models from just after WWII. 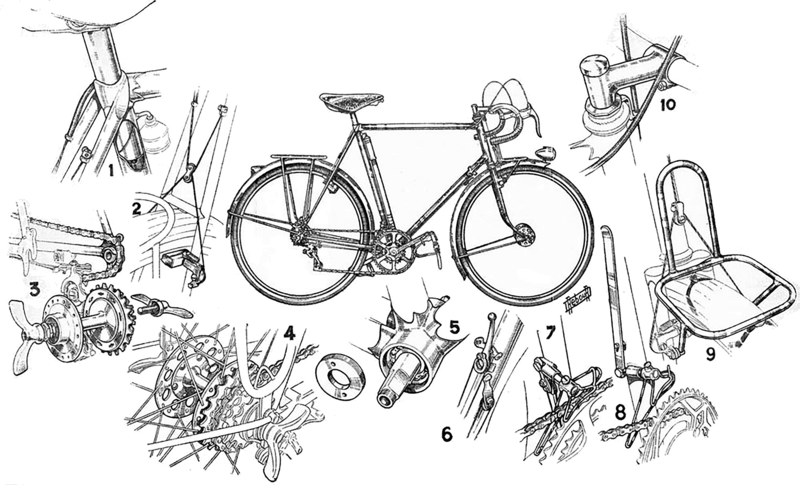 Technical innovation is nothing new to the atelier, either. 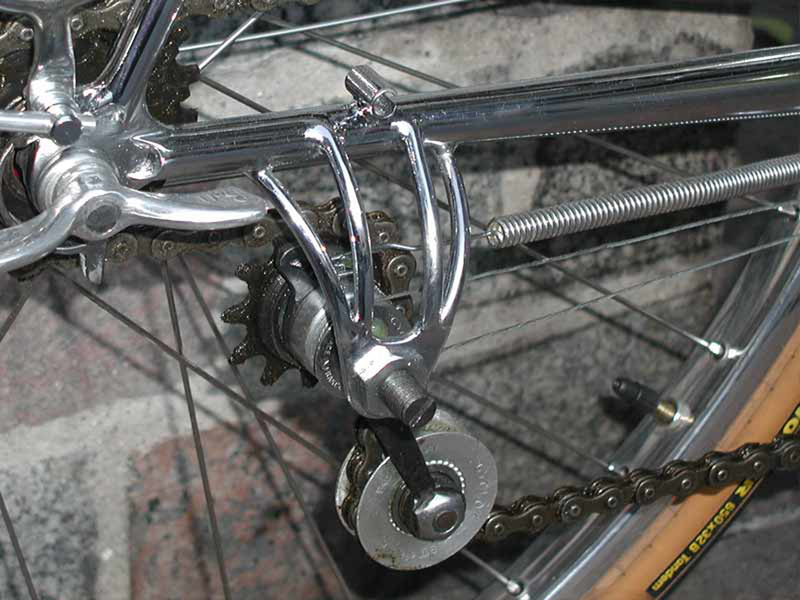 Certainly a company that built ultralight touring tandems in 1939 does not ignore engineering. 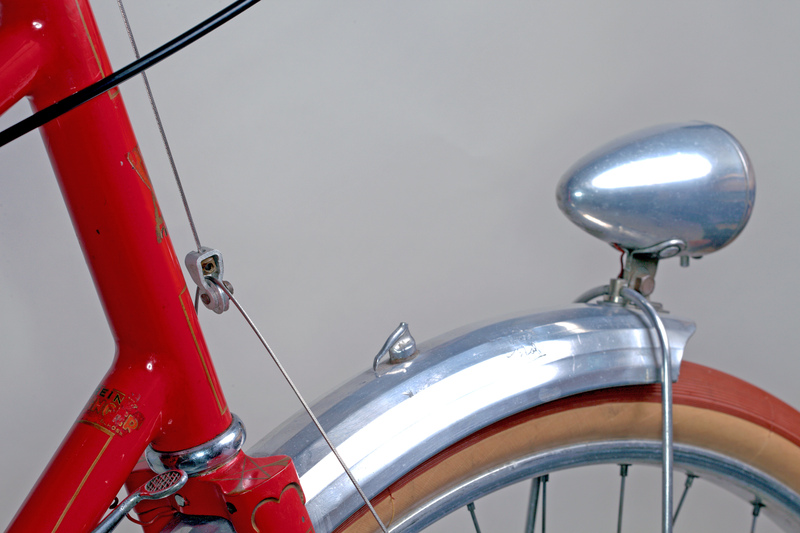 These bikes, which have been described as “jewel-like,” are extraordinarily elegant in their composition and representation while still remaining utterly functional. 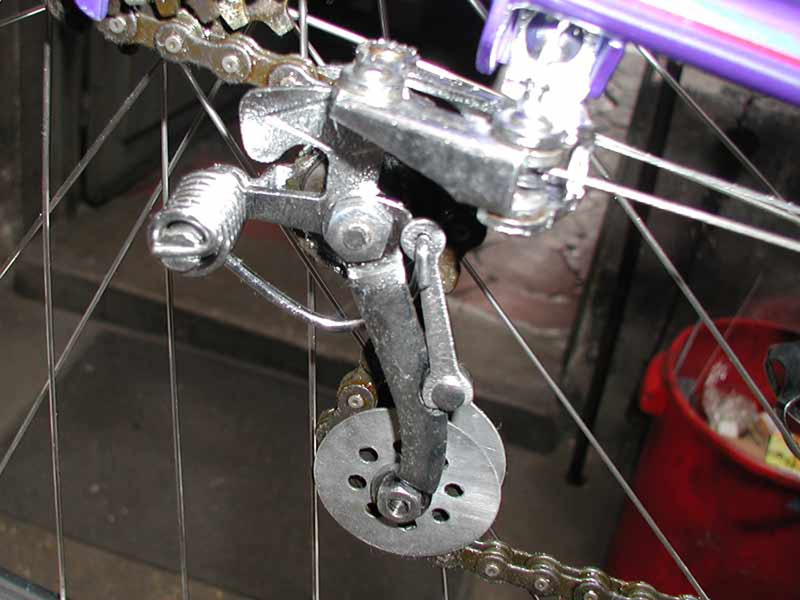 Even the otherwise lowly derailleur mount gets elevated to an art form at Cycles Alex Singer. 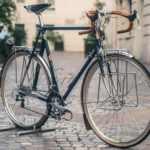 These bikes also have durable guts: in 1949 Singer applied for a patent on a cartridge-bearing bottom bracket that greatly improved the component’s reliability, so important to the far-traveling loaded touring market. 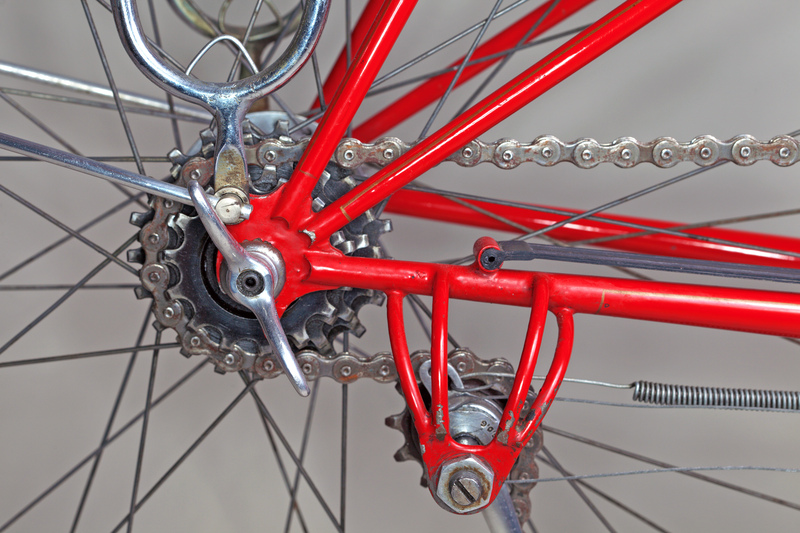 Not only did he design an effective — at the time revolutionary — bottom bracket, but Singer designed it so one could easily convert existing bottom bracket shells to accommodate his improved solution. 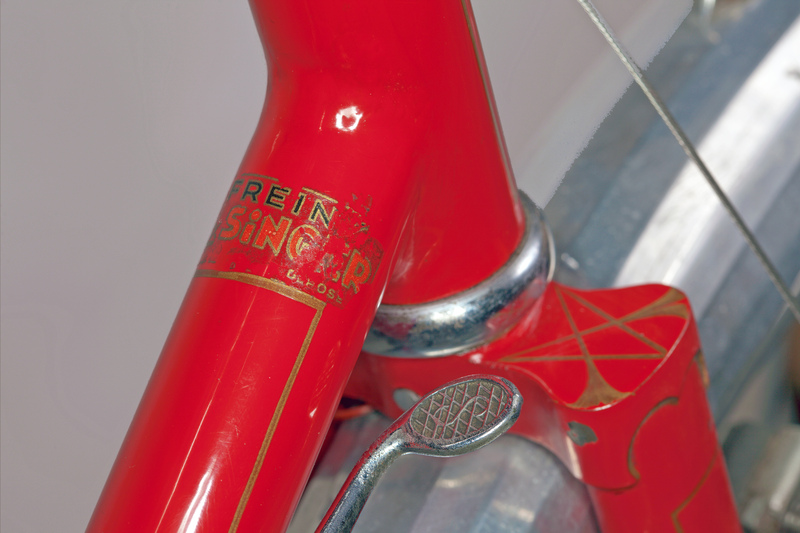 Singer also invented cam-actuated brakes, and his racks, fenders, headlight mounts and other details have been copied not only by adulatory Japanese builders but also by other French greats, such as Gilles Berthoud, and now U.S. designers like the aforementioned Rivendell and Kogswell, all of whom released French-style bikes recently. 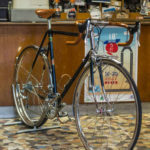 These homages to Singer are for the most part built in high-level ateliers in Japan or Taiwan, and are not, except for the Rivendell customs, made to measure. Close, but not quite the same level of commitment going in or excellence coming out. It really is in the details. 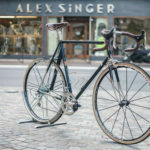 So in effect, Cycles Alex Singer, a small shop founded toward the end of the first great bike boom, is the inspiration for a new generation of high quality bicycles that will populate the roads and trails of the next great bike boom. It remains fitting that genuine Alex Singers will continue having a position at the lead of this effort entering the new millennium. This is a wonderful thing for us all. 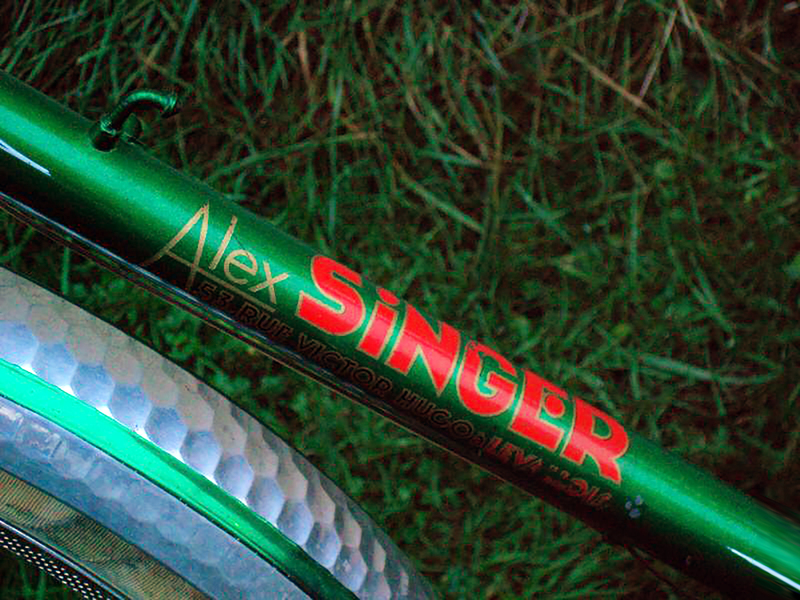 And riding an Alex singer is a real pleasure. It’s such a beautiful bike that riding become easy. I mean that my Singer is so beautiful that it help me when the road is too hard, and distance too long. And I can pass long time just to look at my bike, so riding is never boring, even long rides. 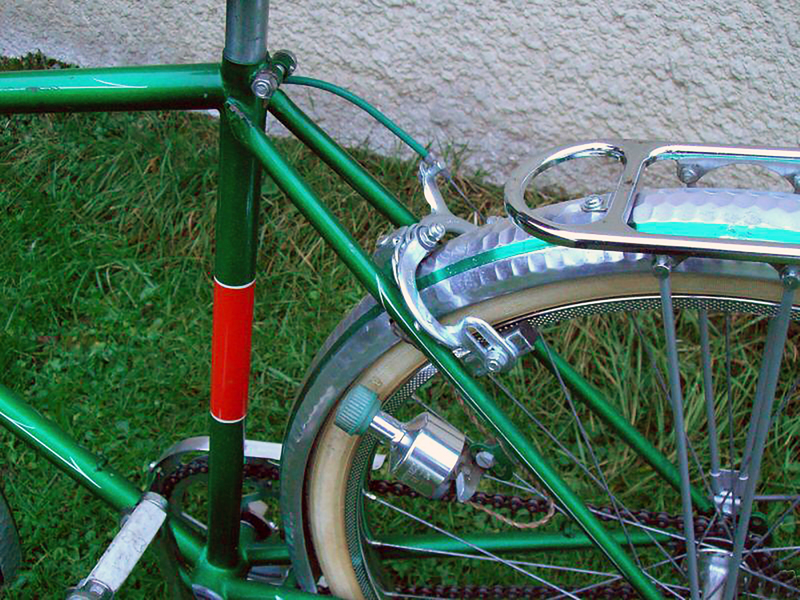 I can swear now, even if I am only 30 years old, that I won’t never change my Singer for any other bike. I am going to be in Paris the last week of June 08. Is there any way I can rent a Herse or Singer there?